In February and March of this year a group of local citizen scientists (Skagit Beach Watchers), students in Shannon Point's Multicultural Initiative in Marine Science Undergraduate Participation (MIMSUP) program, and faculty from Northwest Indian College (NWIC) participated in two sampling cruises on Friday Harbor Lab's R/V Centennial. 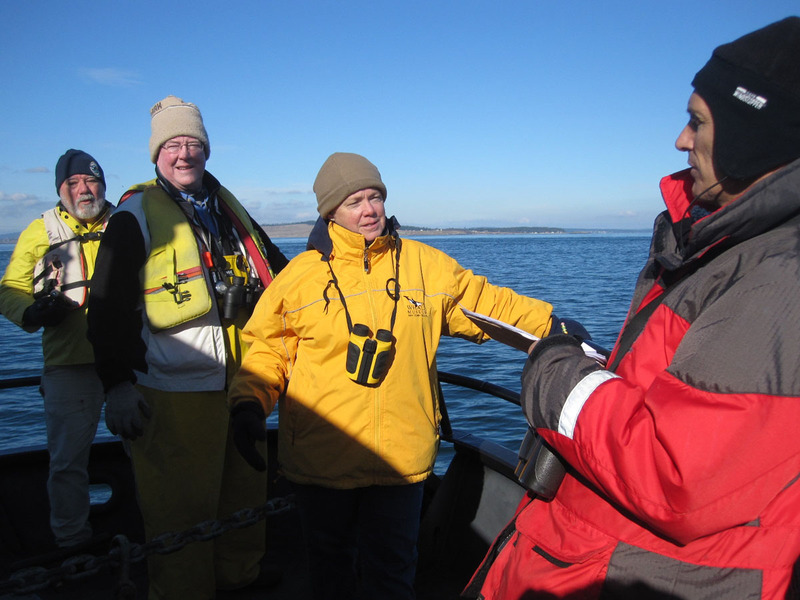 These cruises are part of an effort to engage public audiences and underrepresented groups in an ongoing investigation of Pelagic Ecosystem Function that has been conducted by Jan Newton (UW/Applied Physics Lab) since 2003. We were blessed with amazingly good weather (especially for late winter in the Pacific Northwest). The Beach Watchers were responsible for conducting bird and mammal surveys along the cruise track, while the students were responsible for collecting and filtering water collected as part of CTD casts. We will be doing additional cruises in the summer which will be manned by Beach Watchers and interns in the Native Environmental Science program at NWIC. Phil Green (The Nature Conservancy) supervises Skagit County Beach Watchers during bird and marine mammal surveys in the San Juan Islands.